Even my sleep deprived eyes could see that I was in the middle of grand splendor at the Wat Phra That Temple Doi Suthep in Chiang Mai, Thailand. I can’t fall asleep on planes and I can’t feel fresh without sleep, hence the first day of a trip is usually tough for me. I visited the temple on the very first day, walking like a zombie and yet I came back completely awed. 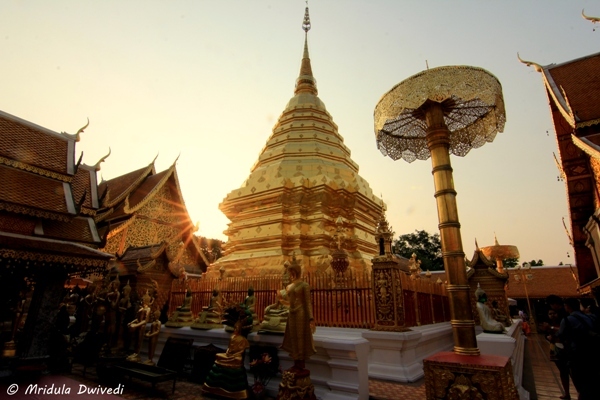 Wat Phra That at Doi Suthep in Chiang Mai is a spectacular Buddhist Temple. Doi means a mountain so Wat Phra That is the temple on Suthep Mountain. But the temple is popularly known as Doi Suthep after the name of the mountain, I suspect because it is easier to pronounce? The Legend: The construction of the temple started in 1383 or thereabout. 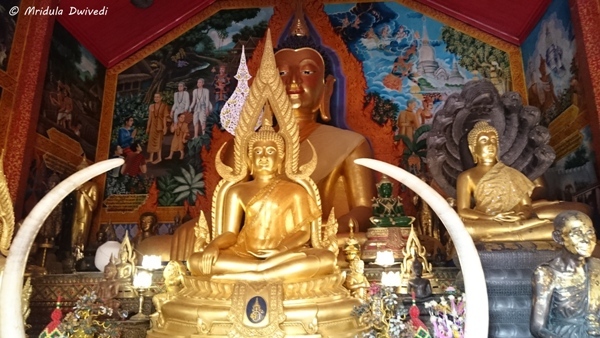 The temple is considered to be holy as it treasures a relic of the Buddha. There is a legend associated with the temple. 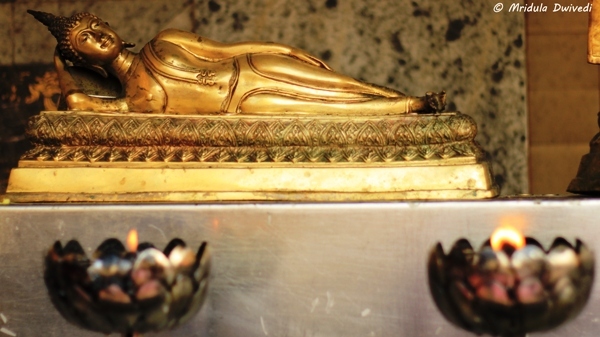 It is said that the King of the Lanna Kingdom kept the relic on a white elephant, so that it would lead the way. The elephant climbed Doi Suthep, sat down there and then died. It was considered a sign to construct the temple there. The Climb: The nagas mark the way up to the temple. 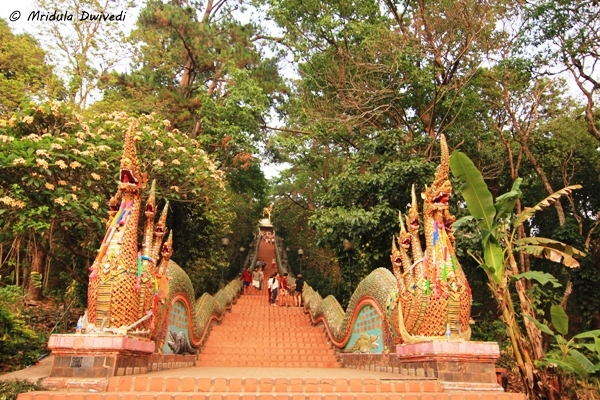 There are about 300 steps to climb to reach the main temple. However, if due to any reason you do not feel like climbing the steps, there is a cable car available to go to the top for a fee of 30 Baht. As we had landed the same day in Thailand and were feeling quite sleep deprived, we took the cable car to go up but we came down by the steps. The Periphery: The temple has two parts the main pagoda and the periphery. Our guide Aroon explained a holy practice at the periphery of the temple. 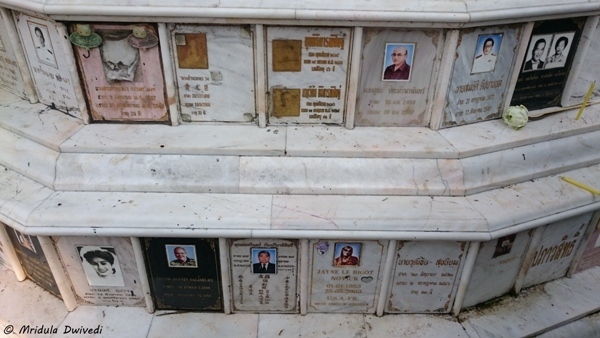 The pictures of the people you see are vaults where their loved ones have stored their ashes. People from all religion can use the temple to honor their loved ones in this way. After a while it is possible to remove the ashes and move it to another temple or to set it free in a river. To enter the main temple it is compulsory to remove the shoes. The periphery provides a sweeping panorama of the city but unfortunately for us, the weather was hazy. 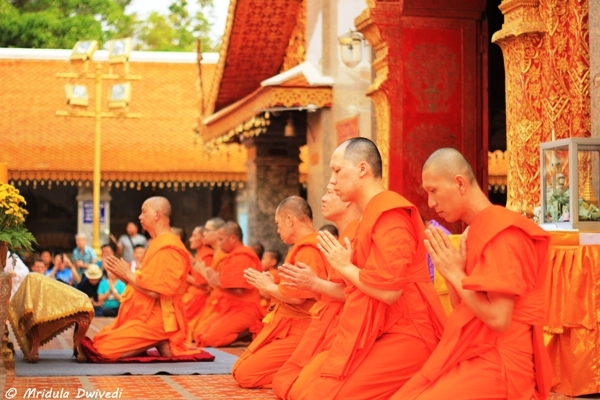 The Dress Code: The temples in Thailand have a dress code. You are supposed to cover your knee and shoulders. So a t-shirt with sleeves and trousers would work well. Technically capris that cover the knee are fine, but I prefer to wear a jeans or a full length trousers. 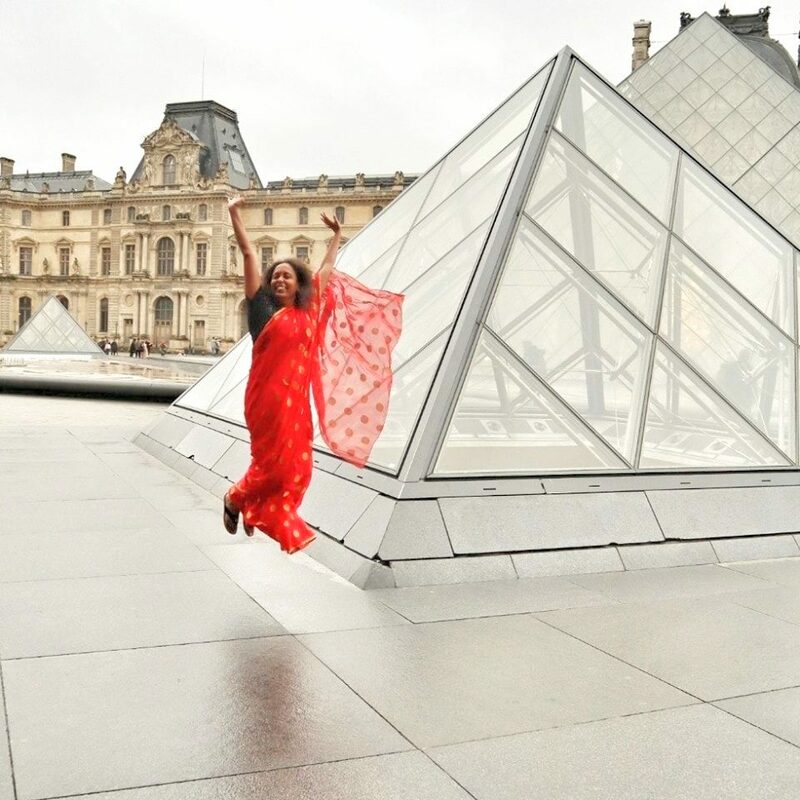 Time: Even though the temple complex is not huge, it is so full of beauty that I would recommend more than an hour to explore it in any detail. You would stop at almost every step to peer about something or the other. If you like to click pictures I would say double that time. The Inner Temple: Peace reigns within the inner complex. There is no restriction on photography in the area. People offer flowers, light candles and lamps and generally pay their respect. The place is popular both with the locals and the tourists. 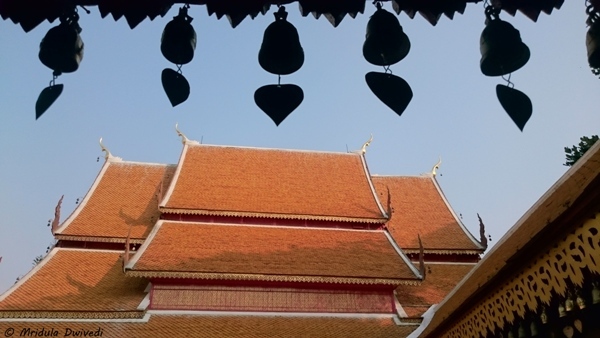 The Small Wonders: I found the small things at the temple so very beautiful. I do not understand the meaning of the symbols clearly, say for this red vessel. But it is a thing of beauty and joy to see the colors in all quarters. 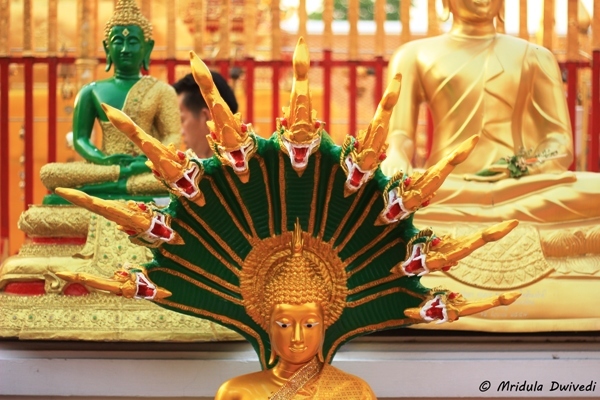 The Vivid Nagas: I was also mesmerized by the details of the idols. 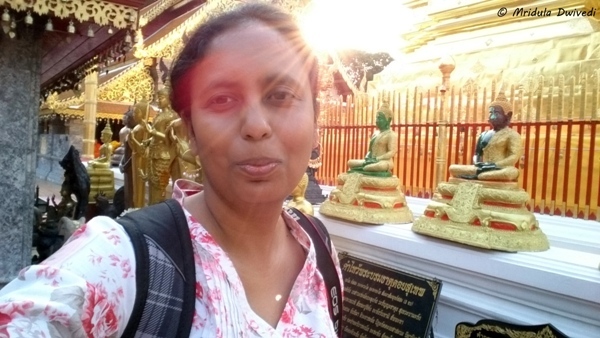 As an Indian I am no stranger to the nagas but the next time I end up in Thailand (I hope I will go back) I am going to explore their significance in Buddhism as well. The Main Halls: I could see two large halls within the inner circle of the temple. This was the only place where they had put a notice saying ‘please sit down while taking pictures’. Such places usually make me feel at rest. But on that day I was too tired and restless to sit quietly and contemplate for a while. 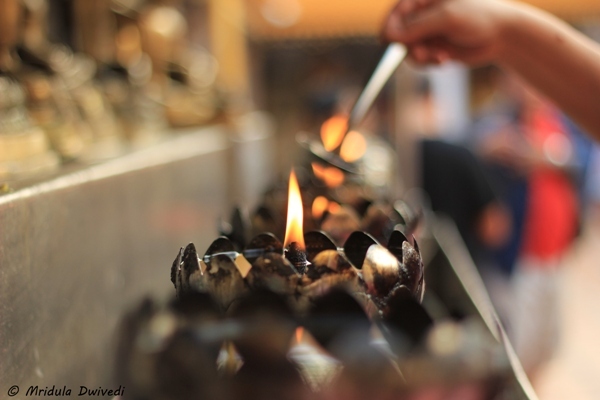 Lighting the Lamps: There is something about burning lamps that draws me like a magnet, be it any place of worship. You can take in all these visual delights if you walk slowly around the inner circle. Evening Prayers: We were lucky to sit through (should I say photograph?) the evening prayers. Once again there is no restriction on photography. There are only two expectations, that you would also sit down and that you would keep quiet. Writing our Names: There is a cloth in the temple where you can write your name or wishes and it is eventually wrapped around the structures in the temple. Most of us were content to write our names, maybe add the name of a dear one too. But one of our team members, Gaurav, would write a story! May God grant him whatever he was seeking! The Warm Evening Light: If you are particular about photography I would say go in the evening as the fading sun turns the temple into gold! I accidentally discovered that the sun rays were falling on my face! I mean who would not click a selfie in such a scenario? 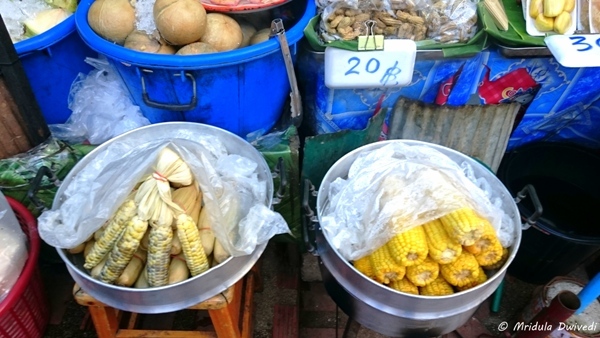 Food and Souvenirs: We walked down the steps straight to food and souvenir shops! Walking all around is bound to make you hungry. I so love Thai street food. Munching on rice cakes we walked off from the area! 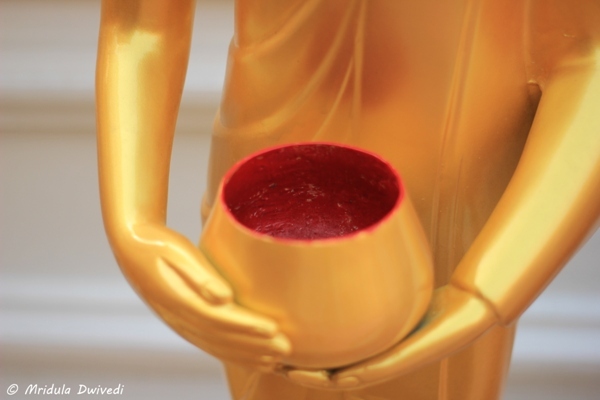 It was a perfect end to a lovely visit to Wat Phra That Doi Suthep in Chiang Mai.